For this month's Indies Unlimited Reading Challenge, I'm reading a book from another culture than my own. 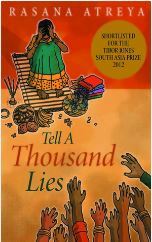 I've chosen a book that I have been meaning to get around to reading for several years: Tell a Thousand Lies by Rasana Atreya. The book is set in rural India, where a grandmother has taken on the task of raising three sisters: Malli, the eldest; and fraternal twins Lata and Pullamma. In this traditional village, the most a girl can hope for is a good marriage, and these girls have no dowry. But it's worse for Pullamma, as her skin is darker than the other girls', and she grows up hearing -- and internalizing the message -- that her future is hopeless. But then, a local strongman sees a political angle. He pays the village soothsayer to claim that Pullamma is a goddess reborn, and suddenly the girl is the center of a lot of unwanted attention. Eventually, she escapes -- but the corrupt politician still has his hooks in Pullamma and her family, and her life will be ruined many times over before she has an opportunity to triumph. Atreya champions the rights of Indian women in this book. Pullamma's twin sister Lata wants nothing more than to get an education and become a doctor -- which her traditional grandmother considers to be madness. And too, the whole book is quite a send-up of the idea that women should only aspire to make a good match, and then be obedient wives -- nothing more than that. My only quibble is that the plot gets quite melodramatic -- very much like a soap opera, with one horrible thing after another happening to Pullamma, her husband, and Lata. I've only seen one or two Bollywood movies, but the plot here is very much like one of those. If you like Bollywood flicks, I'd highly recommend Tell a Thousand Lies.